... A brand new dining set! Okay. He didn't buy it for me. We bought it for us. 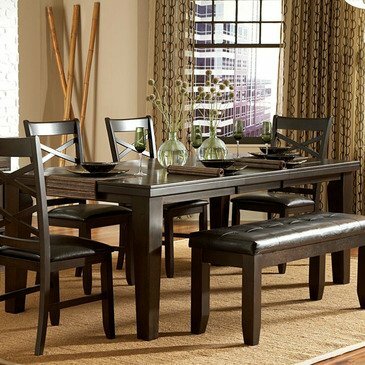 After doing some online research, I found a few dining sets that I liked (and could afford.) I then cross-searched the maker/designers of the sets I liked, and low and behold, we made our way to a furniture store not too far from home. Today, my fabulous husband worked from home so the nice furniture dudes could deliver my new set. Isn't it purdy? It's the Homelegance Hawn style dining table, bench, and side server, and the Crown Point style chairs. And, yes, I will post photos of my own... once I clean my kitchen/dining room area. These photos will be replaced, soon.